A hefty ticket for violating a questionable bylaw has reignited an old Halifax battleground. Recently Justin “Jupiter” Wiles of Berzerker Lion was stapling his band’s poster to a power pole at the corner of Hunter and Cunard Streets when a police officer turned his vehicle around to talk to him. The officer asked him a bunch of questions—name, place of work, phone number. “I decided to comply because I’m wary of police,” Wiles recalls. The cop slammed him with a $405 ticket for postering under the city’s little-enforced temporary signs bylaw. “I’ve been postering for at least four years now, and this is the first time I’ve been ticketed,” Wiles says. I can confirm this. I’ve postered for a monthly dance night for the past two years without a single officer approaching me. Vigilantes tear down posters in the north end, but that’s a different story. Wiles wonders whether his ticket had “a leg to stand on.” He plans to fight the fine if it goes to court. The timing couldn’t be better for the musician. 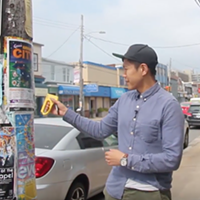 The city has drafted a new temporary signs bylaw, and if Council agrees, postering on power poles would finally be allowed. The city will hold a public hearing in early December to discuss the changes. 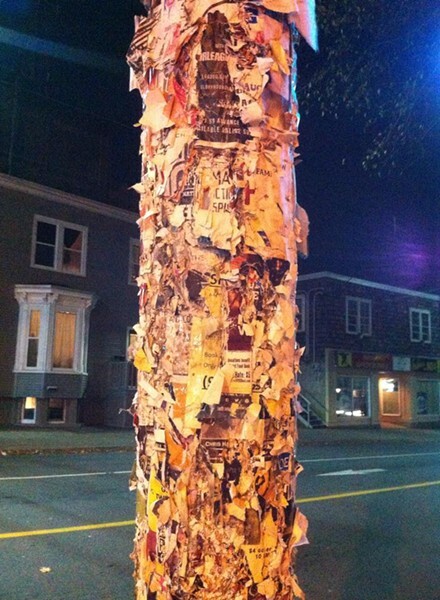 There’s a good reason to update the bylaw, as anyone who posters regularly in Halifax will tell you. The Supreme Court of Canada ruled in 1993 that the city of Peterborough couldn’t ban postering on public property because it was a violation of the Canadian Charter right to free speech. In 2010, HRM fined Evolve Festival organizer Jonas Colter $4,500 for postering, but the city eventually dropped the charges. “It was shown that there was a conflict between the bylaw and freedom of speech, essentially,” Wiles says. Poster guru Ian McRuer knows this legal spiel by heart. During an organizing meeting against the enforcement of Bylaw S-800 at the Bus Stop Theatre last week, the veteran event promoter recounted his favourite war story. Once, a cop slapped him with a familiar fine of $405. As McRuer tells it, the officer wrote the wrong information on the ticket, so it was thrown out. The officer then tracked down his mother’s address and sent a new ticket by courier, which his mother signed for. McRuer wanted to fight, but he knew it would take years to move through the courts, so he ponied up the cash. That was last spring. Since then, a city staffer hired him to put up posters on power poles for the Hopscotch Festival. The city paid him $400 total. Councillor Jennifer Watts says the city has been in the process of updating the bylaw since at least the beginning of the summer. “There’s been quite a bit of discussion about the ability to do enforcement around that, so I think that’s probably something that if someone has received a ticket, they should use the process to appeal that,” she says. 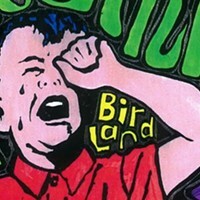 The Scott Tappen Retrospective at Parentheses Gallery runs concurrently with the Halifax Pop Explosion, giving everyone a chance to peek back into the vibrant ‘90s music scene, as seen from a telephone pole.